I woke at 6:30 to the alarm, and for the first time this trip, I rolled over and pulled my sleeping bag up over my head, denying the days approach. I had been having a fantastic sleep from the utter exhaustion of Makaleha and could barely bring myself to think about doing it all over again. The Blue Hole hike we had planned that day sounded essentially like another river scramble, and everything was still pretty wet and muddy from the day before. As we sat up and had a banana, Leigh Anne voiced similar concerns. We decided that it was going to a big enough mission to try and get to the Tunnel Hike trailhead, which was up in the middle of the island. So instead of Blue Hole, we decided to spend the morning drying out our things and then hitch to the trailhead for the Tunnel Hike where we would camp that afternoon, ready to hit the trail first thing in the morning. With the new plan in place, I had a blissful morning sprawled out on the beach surrounded by shoes, socks, the tent, shirts all drying out. 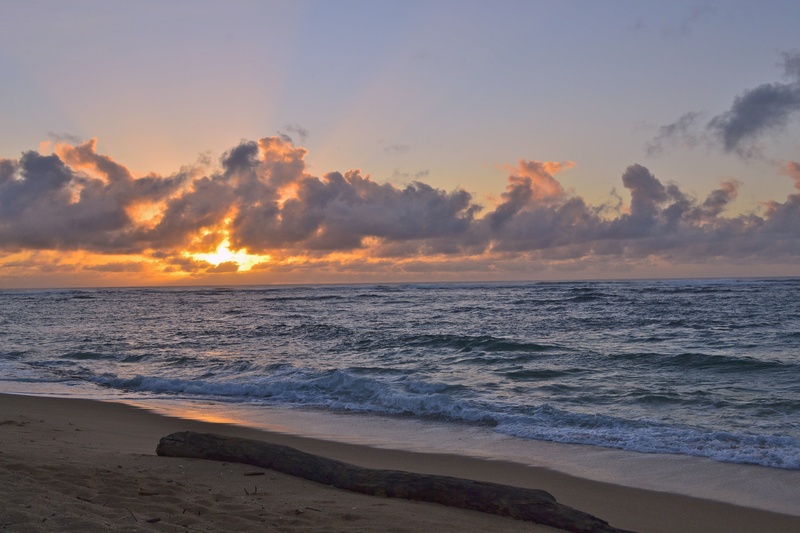 I read and swam in the beautiful, clear waters of Kapa’a Beach, and for the first time since coming to Kaua’i, I felt like I was on vacation. We made our way to Kuamo’o Road at the southern end of Kapa’a, the top of which would be the start of the 4WD road out to the Tunnel Hike. We were both in high spirits – it’s amazing what being dry and a little rest will do for one’s state of mind. After a few rides, we were eventually picked up by Nishelle who was only going a block up, but offered to drive us all the way to the Keahua Arboretum, which was the start of the 4WD track that would lead us to the trailhead. We roughly had about 4 miles ahead of us, so we started on our way. The going was muddy and damp with a river crossing straight off the cuff. The mosquitos were out in full form and I think we were both thinking back to our morning when we were dry and warm on the beach. Instead, we were walking towards the world’s wettest spot…literally. We were both feeling a little disheartened by the lack of camping options. 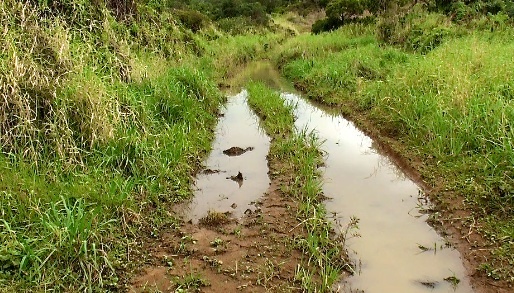 In fact, the bumpy marshy road was flanked by intense bush, and from time to time a light rain would come through sinking our spirits further. It was a generally pretty dark and dank area. Then we reached the start of the trail, to get a glimpse of what tomorrows hike would entail. I peeked down it to see the bog of eternal stench – intense mud spread out in all directions. Puddles, no, lakes of mud lay before me. I walked back to Leigh Anne who was as disheartened as I was. “Does the book say that the start of the trail is as muddy as hell?” I asked. “Yep” she answered. We were at a loss. We had already given up the Blue Hole hike, so it felt like we were wimping out due to a bit of mud if we didn’t follow through on this one. We started back to look for a place to camp when we heard voices coming from the track. A couple emerged from the bush, muddied and cut. I decided to approach them. “How was the hike?” I asked, hoping that it was amazing to warrant the mission out here. They were Paul and Annie from Prince William Sound in Alaska. They were seasoned hikers and had in fact done most of the hikes we had done or were planning to do. They said that the mud didn’t stop at the start of the trail, but that it continued throughout the entire hike. The scrub closed in low so that Paul was constantly ducking and bent over to avoid being struck in the face by twigs and sticks. But a few bleeding cuts on his forehead suggested that even this didn’t prevent contact. “What about the tunnels?” Leigh Anne asked, glancing over at me as Paul responded. “The tunnels? Nothing special about them! They were just regular wet, dark, manmade tunnels.” said Paul assessing his muddied up legs. “Wasn’t there a waterfall or an epic view at some point?” I asked, trying to find any reason to stick to our original plan. Turned out it was just a muddy scramble and what they categorized as “a hike from hell.” Paul and Annie did a pretty good job of deterring us from the hike, but now we had to come up with yet another new plan. They offered to give us a lift back to a camping spot we had spotted near the beginning of the 4WD road and pretty close to the start of the Powerline Trail which we decided to do the next day instead. We thanked them profusely and started down the bumpy potholed road, having to jump out every few minutes so Paul could negotiate particularly tricky parts of the road without our added weight. They were a great couple, who kept starting anecdotes with, “when we were driving through Baja California” or, “when I was hang gliding in Washington” or, “back when I worked on the crabbing boats” etc. Leigh Anne and I were all ears, and we swapped information receiving an open invitation to stay if we ever made it to Alaska. And so with our new plans set, the tent under a huge tree on a small grassy field, we boiled up some water and noodles for dinner and had an early night, all set for the Powerline the next day. But it wasn’t to be that easy. Before the alarm even went off, Leigh Anne was bent in pain. Of course, Leigh Anne, being who she is, didn’t voice her concerns until we had packed up the tent and begun on the walk to the trailhead. She was hanging back, head bent as I walked ahead. I had seen it before and I knew something was off, but again, knowing Leigh Anne, I wouldn’t say anything, and she would let me know if it was too much. She stopped. I turned around. “How bad?” I asked choosing my words carefully. “Bad…something’s not right,” her eyes cast off, as if focusing on something in the distance. I had already decided that Leigh Anne wasn’t going to do the Powerline Trail. If you aren’t feeling at least 100% then you shouldn’t think about doing a trans-island 11-mile hike. But Leigh Anne would have to come to that conclusion herself. We sat at the foot of the trail in silence. “I mean…I think I will be able to do it,” Leigh Anne said, trying to convince herself that she could. But she would wince and involuntarily clutch her stomach, making it impossible to mask her pain. I could just offer words of comfort. Leigh Anne, in all the years I’ve known her, has never admitted defeat. She did the whole Maui trip with a fractured elbow. And even then, she had tried to paddle out and surf. Admitting any weakness was such a harsh and heavy blow to her, I couldn’t really comprehend what she was feeling at this moment. It wasn’t until I noticed a single tear rolling down her cheek that I knew she had made up her mind. “Take the camera and compass” she said, not looking at me. I silently followed her instructions. “You take the rations; I can take the sleeping bag and tent. 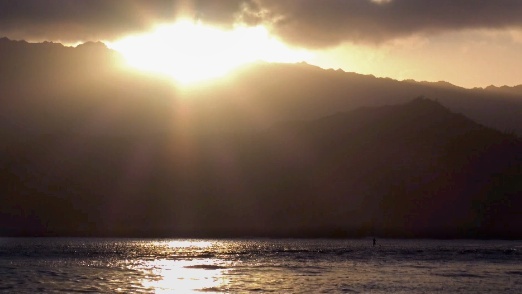 We’ll aim to meet at Hanalei Pier between 4 and 5 this afternoon.” She then looked at me. “Sorry Av…I…” before trailing off. We had a long hug, and one of the saddest things I’ll ever see, Leigh Anne, head bent once more, not looking back, trudging off down the road – alone. And so for the first time in two weeks, I would embark on a lone hike without Leigh Anne by my side. I was left with my thoughts as I started on the slow ascent, and would be stuck with them for the rest of the day, not seeing another soul until Hanalei. 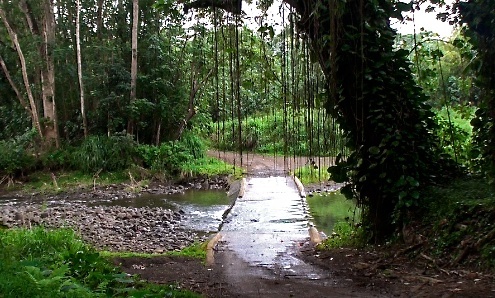 The track is a dirt road that has been cut through the bush for the powerlines to run through the island from northern Kapa’a to Princeville. The powerlines, though never far from sight, were hardly a hindrance to the magnificent views on either side as I climbed. Majority of the ascent was fairly easy, with a couple of more difficult climbs up the red clay, but nothing too harrowing. The track alternated between a skinny mud path surrounded by grasses and ferns, and the aforementioned red clay on the uphill slogs. To my right, large valleys opened up, incredibly lush, with the occasional waterfall spilling off a faraway cliff. 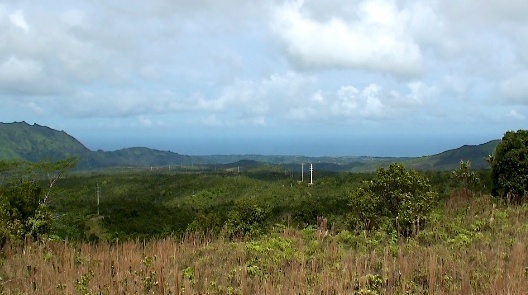 To the left, the mountainside fell away to the coast south of Kapa’a, and I would look back to see the powerlines swinging away, marking my trail thus far. It really was an enjoyable walk, just me, enormous valleys on either side as my company. I reached the top after a steep little climb to awesome views of lush valleys folded all around me. The sun had come out, so I took the moment to lie in the grass and have lunch on a little sheltered bluff on the other side of the summit. The way down was a little harder to navigate my way through the tall grasses and the often disappearing trail. In parts, it appeared as though there was no trail at all, but instead that a solitary cow had meandered through the grass. Eventually, after climbing down, the path turned virtually inaccessible unless you were willing to walk through a deep, muddy swampland, which in places came midway up my shins. I had no choice but to continue and so I forged ahead. Drenched, and getting a little tired of the endless marsh, I sloshed onwards, often falling into the long grasses which bordered me on either side. At times, the path would open up onto gravel or hard clay, but before long it would delve back into swamp status and my eyes would be glued to the path, trying to find a dry route which was, in the end, impossible. At one point, an entire chunk of the trail had fallen into a deep ditch, probably from flash flooding, causing me to scramble/fall into the ditch and climb back out. And then it started raining. Still, with the marshy trail and the rain coming down, I was in excellent spirits, enjoying the fact that it was just me out there, in the middle of this entire island, not another person or thing for miles, just the powerlines guiding my way. After a while, the track made itself a little more trail-like and walkable, and it felt good to be back on firm ground. Wild orchids burst out from the bush on both sides and the valleys fell away revealing an ocean in the distance. The north shore was in sight, I just had to keep going. I walked on, my leg and back muscles making it known how hard they had been working. I eventually reached the end, congratulating myself at completing the 11 mile crossing solo. But it didn’t end there. I still had to make it to Hanalei to meet Leigh Anne who, after going to the clinic, was hopefully cured of all the pain and nausea that she was experiencing earlier that morning. I was on the outskirts of Princeville out in the country with houses and farmsteads spread out about ½ a mile from eachother. After a brief time sitting down without my pack, I found it painful to get moving again. I felt like the tin man in great need of his oil can. I walked in the brief spells of rain and sun, a few tractors buzzing lazily a few fields over, horses looking at me curiously as I passed. I imagined what I must look like to them – this soaking wet, muddy creature with his life affixed to his back and walking aimlessly down this forgotten country road. I was good material for a John Denver song as I ambled on, waiting for a car to pass, to take pity on this poor country soul. Luckily someone did. A young couple pulled over, a girl leaning out the window. “You need a lift” she said, not so much as a question but a statement. “Yeah. I do.” I laughed and hauled my stuff into the back of the truck with help from the guy. “You just come out of the 11 mile?” he asked. “By yourself?” he asked raising an eyebrow. “Yeah,” I laughed, hands on hips. “Dang.” He took his hat off and wiped his brow, as if just the thought of the hike exhausted him. They took me all the way to the campsite by Hanalei Pier, which as it turned out only allowed campers in the weekend…by permit. It wasn’t the weekend and we didn’t have a permit, but it was the rendezvous point for Leigh Anne and me, so I decided to just wait and we would discuss our next move when we met up. I sat down on the beach and once more peeled off my socks and shoes, revealing once again a dead man’s feet. They were severely white and wrinkled. It hurt to curl my toes and deep creases filled with red mud lined my soles. Time passed and I walked down to the end of the pier, scanning the beach for any sign of Leigh Anne. I walked back and took up a spot on a log, willing to wait there all night if I had to. I started to panic, going through every scenario possible, conjuring up terrible possibilities in my head. Just when I was imagining Leigh Anne in a hospital bed after some emergency surgery, I saw my old friend ambling down the beach. Both our eyes lifted as I ran to her, hugging her in a tight embrace. It had only been a day and I couldn’t believe how much I had missed her. We were talking over each other, an endless flow of questions and stories on what had happened in our day of separation. We ate at Bubba’s Burger in celebration of our reunion and walked down the beach to a spot sheltered by the trees. It felt amazing to be back on the beach with the pounding surf under a blanket of stars with my travel buddy, safe, medicated and cured of all discomfort, sleeping soundly by my side. We decided on a day of rest to allow Leigh Anne to relax and a chance for my legs to recover from the long haul of the Powerline Trail. It was much needed, and I revelled in the sun and surf, writing and reading to pass the day. We were meeting up with a family of Leigh Anne’s friend David that evening, where we were to get a bed and a shower, both greatly needed as we neared our second week without either. As the sun set over the epic Na Pali cliffs to our left, it cast an orange glow across the ocean, causing the stand-up paddle boarders to become silhouetted as they glided across the surface of the sea. Dogs roamed, kids scrambled in front of each other to leap of the pier, surfers caught their last waves in, the spray from the waves breaking off the point fanned out into the sky. We walked past lazy cyclists and people piling boards into the tray of their trucks, wrapping themselves in towels to change as the sky turned purple. A little group played ‘ukulele and guitar in the small park by the beach. We met the Miles clan at a community outreach barbeque by the pier and settled into an evening of barbeque, guitar and bonfire, everyone eager to hear our stories of the trails we had hiked so far. We feasted on burgers and hotdogs, unashamedly going in for seconds and thirds. It’s just one of the things about travel, these little scenes you find yourself part of. People can be so generous to someone who they have never met. I fell into a conversation with Ian, whose house we were to stay at that night. He was a really interesting guy with a whole lifetime of stories to tell. Tall and wiry with a massive grin and a weathered face, which showed he had spent much of his life outside. His eyes disappeared into wrinkles when he laughed which was often. As the fire turned to embers, we leapt into the back of the truck and drove under the starry skies to Princeville in the cool night air. Leigh Anne was shown to her king size bed, and I was shown to my little roll out mattress outside on the porch. The disparity in sleeping arrangements was hilarious, but I was truly happy with anything. I had a much-needed and long-awaited shower, scrubbing myself down, trying to remove two weeks of mud. In the morning, we woke to grey skies and the outlook for the weather was questionable. 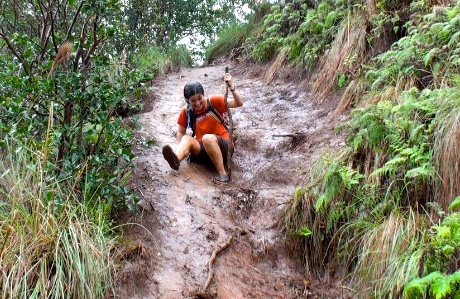 However, we had wanted to get ‘Okolehao Trail in before Kalalau, which was to be our final and climactic hike. We got a ride with a father and son team named Shaky and Jojo, who picked us up in their big old van filled with boxes, books, a surfboard and a cello. They had played on the radio the night before and had told us how they had dedicated a song to their friend who had just died. They told their own stories of Kalalau, how they had hiked the trail with easels and canvases to do some painting. They dropped us at the trailhead where we were farewelled with a shaka out the window. We once again cast our eyes to the sky, which was still grey, before choosing our walking sticks and plowing on. As our guide had indicated, ‘Okolehao was just a 2 mile uphill slog. It was nice at times, climbing up through the eucalyptus trees on the steep uphill ascent. 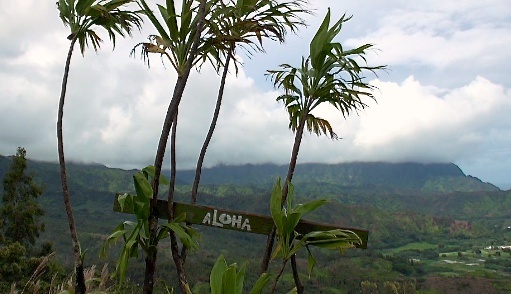 We reached the first viewpoint by my old friends, the powerlines, dropping down into Hanalei. We continued further up until reaching the second viewpoint, which had a little bench with views stretching out from Hanalei to Kailua. We should have just stayed there, but our guide said that there was almost another mile ahead of us to what they promised as “grand views.” Not to mention, the rabid rat where we were currently standing was giving us the eye. Still, we should have stayed. Not long after we continued on, the rain started to fall. It was only a light shower but more would come. The trail turned narrow and muddy in places, forcing us to climb up using roots and trees for leverage. Once again, the native ferns of the Honopu ridge trail were back closing in on all sides. Between my pack and my walking stick, it was nearly impossible to pass through them as they constantly clawed at me, dragging me back. The trail worsened, the weather worsened, and my mood worsened as we continued on. I was swearing and fed up, slipping in the mud. We reached the “viewpoint” which offered nothing, as we were clouded in. Dissappointed, we made our way back. Not long after we had turned around, a low rumble rolled across the valley and the heavens opened up as monsoon conditions started down upon us. Raindrops which seemed like the size of my fist hurtled down, making the already difficult descent nearly impossible. The track was now a river, a deep muddy river, making the steep parts turn to waterfalls. To protect the equipment, we had to sacrifice our rain jacket and poncho, wrapping the cameras in a tight waterproof bundle, causing us to be soaked to the bone in seconds. At certain parts of the trail, there was nothing we could do but to slide down on our asses, making us not only soaked but covered in mud. Leigh Anne had a particularly well-executed slide which took her quite a fair way down the hillside, as she was simply unable to stand on the slippery slope. Once she did, there was a deep bow, and a roaring applause from me. All we could do was laugh, but pretty soon the joke was over as we trudged on, heads bent against the rain, eyes glued to the trail, trying to navigate the safest, easiest route. We made our way down the last switch back section; the middle of the track was flowing quite fast by this point. We reached the trailhead; Leigh Anne tossed her walking stick to the side and walked onwards without looking back. As we walked to the main road in the pouring rain, hoping to get a hitch, Leigh Anne kept saying, “people must have compassion” over and over. We got to the main road and were eventually picked up by Stephanie, who I assumed was Buddhist due to the prayer beads and flags that adorned the car. She had even said, “I could see your spirit in your eyes, maybe we’ve met in a past life.” I couldn’t help but find it perfect that after all Leigh Anne’s wishes for compassion, we had been picked up by a Buddhist, who practice above all compassion for others.